Around the globe, most new urban development has adhered to similar tenets: tall structures, small units, and high density. The Human City questions these nearly ubiquitous practices, suggesting that they do not consider the needs and desires of the vast majority of people. In fact, exclusively dense urban development, the book suggests, might be doing more harm to future generations than good. 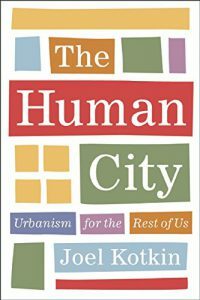 In this book, Joel Kotkin argues that in order to be truly sustainable, built environments must reflect the preferences of most people—and families in particular—even if that means encouraging an urbanist’s worst nightmare: lower-density, suburban development. This approach also could include residential neighborhoods within big cities as well as smaller towns. Kotkin begins by pondering the purpose of the city and investigating the factors that drive most urban development today. Armed with his own astute research, a deep-seated knowledge of urban history, and sound grasp of economic, political, and social trends, Kotkin pokes holes in what he calls the “retro-urbanist” ideology and offers a refreshing case for dispersion centered on human values. The Human City calls for diverse options to meet the changing needs of people in the different stages of their lives. To make his argument, Kotkin examines the good, the bad, and the ugly of high-density environments, including the megacities of the developing world and the “glamour zones” of global metropolises. The book itself has its origins in research conducted by the author in Singapore, arguably the best run of all dense cities. He also explores the thriving small cities, revitalized neighborhoods, and vibrant suburban developments that are already providing lower-density alternatives to centralized, “pack-and-stack” living. Direct, accessible, and thoroughly researched, The Human City reminds us that we are not just the products of demographic and economic forces, but that we can also shape the future we wish to inhabit. That’s one of the lessons of Joel Kotkin’s new book The Human City, which takes a wider and longer view. Kotkin shows how cities developed as religious, imperial, commercial and industrial centers. Whether you’re a downtown dweller or suburbanite, renter or owner, there is plenty of urban food for thought in The Human City. “No field of study — technical or in the humanities — thrives when only one side or perspective is allowed free reign (sic) and granted a dispensation from criticism. The question of the future of cities is too important to be hemmed in by dogma and should instead invite vigorous debate and discussion. The most eloquent expression of urbanism since Jane Jacobs’s The Death and Life of Great American Cities. Kotkin writes with a strong sense of place; he recognizes that the geography and traditions of a city create the contours of its urbanity. [Kotkin] believes it’s time to start rethinking what suburbia can be and to become more strategic about how it evolves. Kotkin is one of the clearest urban writers and thinkers of our time. His first-hand experiences and insights on a broad array of issues such as inequity, infertility, lifestyle, and urban design shake the reader like a jolt of urban caffeine.